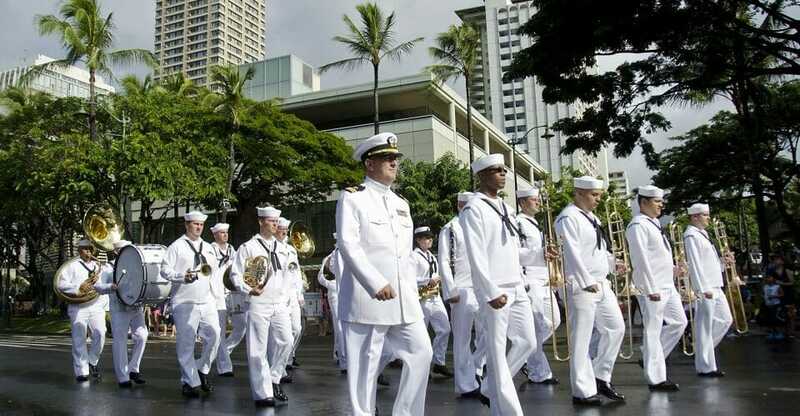 Pay tribute to those fallen during the infamous and tragic 1941 attack on Pearl Harbor by playing in the 75th anniversary memorial parade and ceremony on the beautiful island of Waikiki! Honolulu Lei Greetings - What better way to arrive in the stunningly gorgeous Hawaiian islands than with a greeting by the exceptionally inviting company, Honolulu Lei Greetings. The tradition of giving guests of the island fresh floral leis can be traced all the way back to the early 1900’s, when groups of tourists arriving by the boatloads were greeted by locals donning native flowers braided together, in necklace form. The guests would then throw their leis into the sea by Diamond Head upon departure, with high hopes that they, as the lei, would return to the island soon. Upon arrival you will be greeted with the choice of a standard, silk, superior, or even candy lei, as well as a sign with your name on it upon request at the airport. The company will then even go as far as to lead you to your next terminal or island transportation system, answer any navigational inquiries, and hand out maps of the islands! Sandy Beach Park - Welcome to Sandy Beach Park, the perfect place to get your first introduction to the power and beauty of Hawaiian island beaches. This beach is located along Kalanianaole Highway on the Southeastern side of the island, the sandy wonder offering guests extremely large shore breaks and strong waves for trained body surfers and curious onlookers. Known for its fine sand and powerful waves, this beautiful and isolated island just beong the Halona Blowhole offers lava rock cliffside and views of Koko Head crater, just beware of the conditions and warnings from the lifegaurd on the day of your particular visit. At times, the waves are too much to enjoy fully, so you may plan to just put your feet in the sand and wade along the surf during your visit to the 'beach of broken necks'. Snorkeling at Hanauma Bay - Hanauma Bay is one of the most beautiful natural wonders of Oahu, Hawaii, a nature preserve and marine life conservation district that works diligently to protect local bay creatures. These creatures have, for the most part, been harmed by human development in previous years, the bay deteriorated and used improperly for commercial business for entirely too long. Today the bay has been returned to a pristine and protected condition, now offering a vast array of natural wildlife adventures. Tour the area, dive beneath the deep blue surface to see some sea turtles, explore the reef, and even see for yourself a school of parrotfish if you’re lucky! Enjoy a snorkeling tour through the fields of unbelievably colorful coral beneath the calm turquoise waves, you may even see the state fish of Hawaii, known as the Humuhumunukunukuapuaa (say that 3x fast)! Polynesian Cultural Center - Tonight you and your performance group are in for a real treat as you take part in an authentic Hawaiian Luau at the Polynesian Cultural Center! This cultural center and dinner spot allow guests to explore the rich heritage of the Pacific Islands by means of its 42-acre tropical paradise, the entire grounds featuring tons of gorgeous scenery and traditional hands-on cultural activities. Dine like royalty while here, the authentic Polynesian Luau complete with a lively and largely traditional song and dance evening show. The Ali'i Luau buffet option, including tropical steamed fish, glazed chicken, strip loin, salmon, poke, tropical fruits, and so much more will be well worth the one-hour trip from the other side of the island, and before you go you will even get to see the Royal Court Procession! A gorgeous sunset, an amazing show, and some of the best local food on the island...it’s easy to see why this experience has won the highly regarded Kahili Award! Pearl Harbor & USS Arizona Memorial - You will absolutely have to take the Pearl Harbor and U.S.S Arizona Memorial tour while here, considering this is the iconic 75th-anniversary date of the tragic event and the memorial is considered to be the absolute number one visitor destination in all of the Hawaii. This landmark attraction sees millions upon millions of visitors from all around the world each year and is considered to be the official Pacific National Monument, the resting place of 1,102 out of 1,177 sailors and marines killed on the U.S.S Arizona during the infamous surprise Japanese attack on the Island. The attack happened in 1941, making this the milestone 75th anniversary, the perfect chance for you to see all the educational museums and sobering galleries within, each filled with exceptionally personally information and respectful memorials. Take any of the several different offered tours around this site, especially popular choices during today’s anniversary event. Lunch and Rehearsal - Next up, grab yourself a bite to eat at any local seafood shack or beachside eatery to fuel up before your big rehearsal and performance. Our suggestion? Head to the nearby Osaka Ramen eatery inside the Pearl Kai Shopping Center and chow down on some delicious, hearty, and authentic Japanese-inspired ramen dishes. These greatly valued dishes include miso, ramen, and wonton, and gyoza, you may even try to get here between 2pm-5pm today for free gyoza during happy hours! (The salt and pepper shrimp here is to die for also!). After your bellies are full head over to a spot near the ceremony to rehearse on your own (the beach is always a great spot to practice) and then join in the mass band rehearsal shortly after. Opening Ceremony - Next up, the moment everyone has been waiting for, the big Opening Ceremony services for the 75th Anniversary of the Attack on Pearl Harbor. This internationally attended event pays excellent tribute to those who lost their lives on that tragic day, a way for the public to express their appreciation for the service and sacrifice of the veterans and their families. This year the theme is ‘remembering our past and celebrating our future’, the entire ceremony filled with honor and respect, as well as several different talented performers (including you of course). The parade includes authentic Pearl Harbor ship representations by way of 40’ models, several different bands from both America and Japan, local officials, international leaders, and of course, many affected locals. This ceremony will allow your group to remember what you came here for, and to get better acquainted with the crowd and your fellow performers. Parade - Now is the time for your band to respectfully strut your stuff and pay tribute to those who lost their lives in this tragic event the best way you know how; playing loud and playing proud! The official 75th Pearl Harbor Memorial Parade will begin directly after the opening ceremony, at 6:30 pm, and will kick off at the site of the opening ceremony, Fort DeRussy. Follow the route of over 60 different visiting and local performers straight down Kalakaua Avenue for about a mile, then head down Monsarrat Avenue to Waikiki Shell, where the parade commences and the closing ceremony begins. Besides your own amazing band, of course, the parade performers will include, as mentioned above, several different high school bands, military bands, state and national dignitaries, military groups, and international officials. Closing Ceremony - Directly after the parade you will follow the route to the Closing Ceremony, taking place at the beautiful and scenic Waikiki Bandshell. This ceremony never fails to bring together all the efforts of the day and the night impressively, recognizing all those who helped make it happen. This ceremony also, of course, pays tribute to those fallen on that infamous day through several different memorials and dedications. The rehearsal from before will come into play (no pun intended) during this ceremony as well, as you and all the other visiting bands will take part in a moving mass concert band performance. This is your chance to play a beautiful melody for the fallen, an overall truly powerful and moving dedication from hundreds of talented musicians coming together as one. Hike Diamond Head - Your final Hawaiian adventure-filled day will include one of the most popular activities on the Big Island, a morning hike of Diamond Head, the extinct volcano located along the eastern edge of Waikiki’s coastline. This extremely scenic and popular hiking destination will provide a rugged hiking trail and unbeatable panoramic views of the surrounding island, a view considered to be the most recognized Hawaiian-essential landmark. This trail also has tons of historic education lining it as well, from old military structures such as the 1911 Fire Control Station and artillery fire battery to the 1917 navigational lighthouse and site of the single explosive eruption that took place here over 3,000,000 years ago. Walk along the new rock that has formed and then go grab a postcard-perfect picture of Koko's head, just be sure to wear good hiking shoes or boots and bring plenty of water, a hat, and sunscreen! Iolani Palace - We think ending your vacation at Iolani Palace only makes sense, this extravagant 19th century home a local historical and cultural staple! This was the home of Hawaii’s last living monarchs, today operating as a museum with several different offered daily tours and educational gallery exhibits. Choose between a self-audio tour or a guided tour as you explore the Grand Hall, Throne Room, Blue Room, State Dining Room, and Private Suites. These entire premises takes about 60 to 90 minutes to tour, just be sure to save plenty of time to watch the onsite documentary back in the barracks before you go. This home is located in the historic district, on the corner of King and Richards Streets, so your group will also have the chance to catch any other local and historic eateries or shopping boutiques on your way out! Be sure to find that lei and throw it back in the water before you leave the island, we know you’ll want/need to come back eventually!